A few weeks ago Enjoy Life Foods sent me a package of their Enjoy Life Semi-Sweet Chocolate Mega Chunks to review. I decided to try the mega chunks in my favorite Double Chocolate Chip Muffin recipe. As I expected, they were awesome! 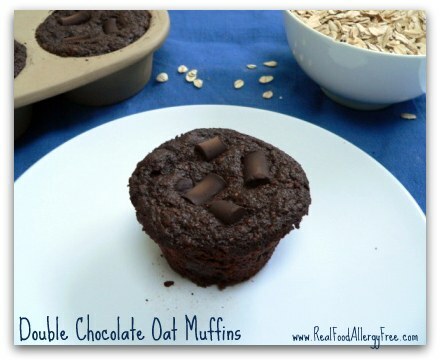 These Double Chocolate Oat Muffins are moist and sweet but not too sweet. The kids enjoy these for breakfast or an afternoon snack. Grease 6 muffin cups. Preheat oven to 350. In a medium sized bowl, combine first 5 ingredients. In a separate bowl, combine applesauce, oil and sweetener. Add oat mixture to applesauce mixture and mix well. 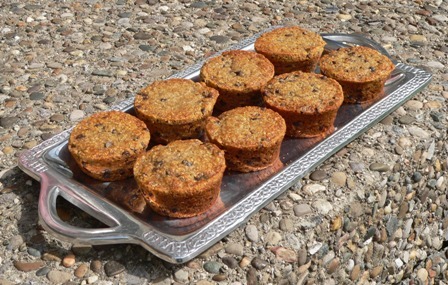 Spoon evenly into muffin cups and bake 20-22 minutes. Muffins are done when the tops are firm to the touch. 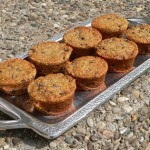 This recipe was adapted from Mariska’s Joyful Heart Fudge Chip Muffins. 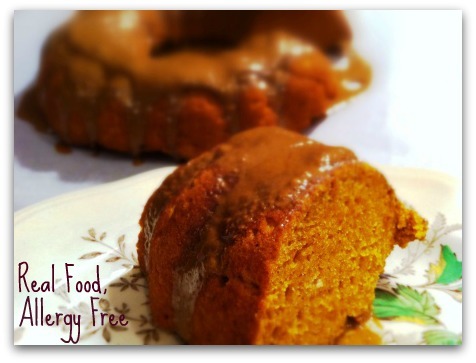 This post is part of Allergy Free Wednesday and Healthy 2day Wednesday. « Amazon Deals (3/23): Rice Crackers $1.38, Sweet Potato Chips $1.98, Big Bags Organic Corn Chips $2.34 and MORE! These look fantastically wonderful!!!! Can’t wait to try them! I’m shocked at the 1 tsp of oil….I wonder what the 1 tsp does or can it be omitted? My sister is on a GF vegan oil-free diet and this recipe is perfect save for the oil. Any thoughts would be most appreciated. Hi Ellen, Thanks for stopping by! I think you should try it without the oil. My guess is it’s for the flavor. I think the muffins will be moist enough without it. If you try it, let me know how it turns out! I’m off to check out your blog! Yum nancy, can;t wait to try these! Pinned! These were delicious! I love the super simple ingredients. They tasted quite sweet to me…but then my sweetness threshold is totally changed now since cutting out cane sugar. I used half coconut milk/half applesauce and increased the oil to 2 tablespoons. Next time I would add chia seeds for some added binding. I also used 1/4 coconut sugar and a quarter teaspoon stevia extract. These will happily be repeated Nanc! Attn Enjoy Life, I would like to review your chocolate too!! Thanks Tessa! That’s great that it was too sweet for you! I am really struggling with sugar right now. My muffins usually bind well. I wonder if substituting some of the applesauce changed the consistency. Of course, adding chia only adds more nutritional value. very likely as applesauce does act as a binder in the absence of eggs….but I think a chia egg would work too. You’re struggling with sugar because it is so darn addictive, and don;t I know it! It’s like crack…really! I have been reading a ton of books lately about the subject…eye opening! That’s fine as long as you give me commission. Ha ha! You can post your version. Just give me credit, please. I would love to try these but worry about calories. Could you post the fat/carbohydrates/fiber/protein content. I’m in the process of losing weight while staying with my GF/DF and egg-free diet. I’m finding it really challenging to try these recipes while sticking to my Weight Watchers goal. I found your recipe via Tessa. Just wanted to stop by and say WOW! Chocolate paradise. Your ingredients are amazing!!!! Thanks for such an awesome recipe. You’re too sweet Erin! Thank you! 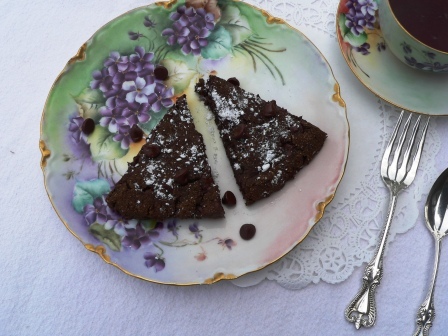 can I use cocunut flour almond flour instead of oat flour? Hi Wendy, I don’t think coconut flour or almond flour would work well without egg. I haven’t baked with almond flour but coconut flour requires a lot of eggs to hold it together. If you can tolerate eggs, http://www.freecoconutrecipes.com/ is a great resource. These muffins are AMAZING! I believe I found this recipe via The Humbled Homemaker. I was a little skeptical at first because I am new to real food so I wasn’t sure how they were going to taste, but they ended up tasting way better than I could have ever imagined! just tried this recipe – it’s great! I will def. check out other recipes on this site. I found this recipe when I was looking for vegan chocolate banana muffin recipes – I’m not vegan, I just ran out of eggs. I liked how simple this recipe was. I used 1/3 cup white sugar. I used some chopped unsweetened chocolate & semi sweet chocolate chips. I’m excited to have these for breakfast throughout the week. also, I switched the applesauce for banana and added 1 tbsp. of water. Soooo good!! Thanks for posting! 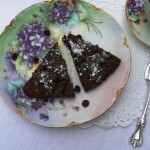 There is no need to ever feed my kids flour or sugar, with recipes that taste this good without them!! I didn’t have sucanat on hand, so I used 1/4 cup of powdered stevia. These were a BIG HIT in my house!! Thanks so much for this! My daughter is recently eliminating eggs, wheat, dairy, nuts and soy. I am no baker so this is a whole new experience for us. 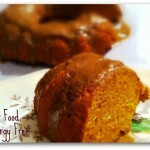 I have tried numerous allergy free recipes that are dry or fall apart or just taste plain awful. This is a wonderful treat the whole family likes. I add frosting and send them to birthday parties with her as a cupcake. Love it! That’s wonderful, Rebecca! Thanks for letting me know.